What has happened to My Little Pony since I was young? I started thinking about this after one of my blogging buddies, Gilliad Stern, posted about the state of boys’ cartoons nowadays. I don’t know much about boys’ cartoons. With two girls almost eight years apart, I have experienced two recent and different generations of My Little Pony. If I count the ponies that debuted in 1983, when I was probably a tad too old (nah) to like them, then three generations. Just so you know that I was a total dork, Spider-Man was really my favorite in high school. I liked him before he was cool. 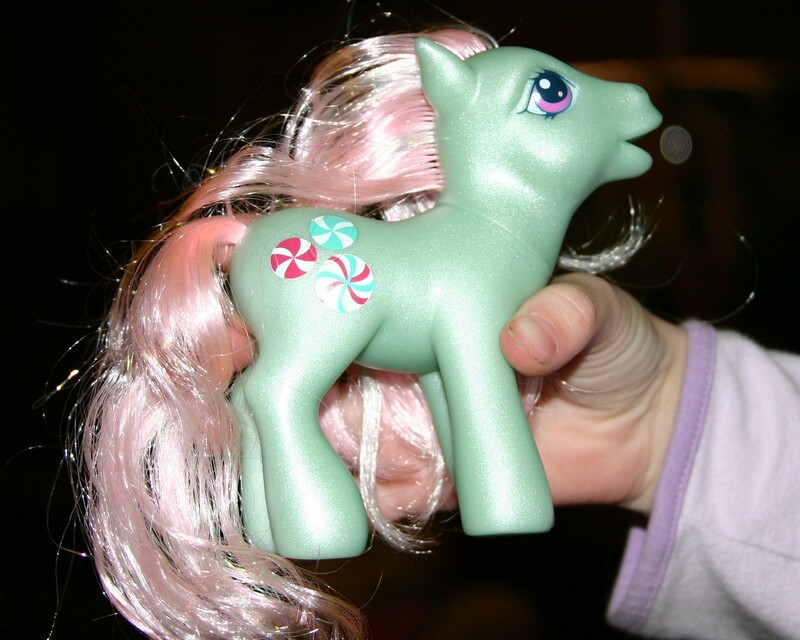 The first MLP toys were fat, friendly, and happy little ponies. Their cutie marks spilled across their flanks and backs. They were fun to draw. Then the unicorns and flying ponies came out. Did it matter than I was in high school? Nope. 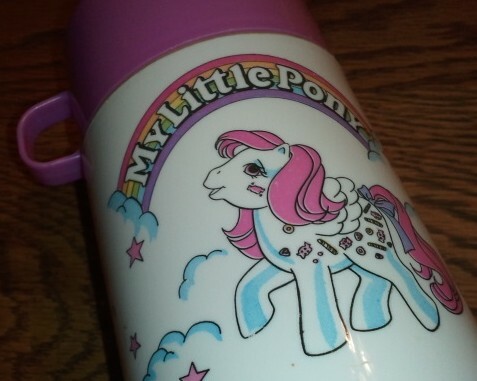 Just look at the cool thermos circa 1987 that I found at my parents’ house. Isn’t she cute? The second generation pony wasn’t as round as the first generation and had a little more expression. By the time my first daughter was born, My Little Pony was on the third generation of the ponies. They were still friendly and happy, but not as chubby as the ponies I had. Here’s where one of the differences is obvious. I owed a couple of ponies. Granted, I was in middle school, so I wasn’t playing with them. They sat on my window sill. Flash forward 20 years or so, and my daughter owned too many to count by the time she was six. Toys are so much easier to buy, it seems, than when I was a kid. The movies for my daughter’s My Little Pony ponies were cute. They marketed the houses, accessories, books, and ponies expertly, but the stories were about friendship, courtesy, and manners. Minty was one of my daughter’s favorites. I didn’t mind so much that Ponyville exploded across the floor and the ponies stayed out to play for days. We read the books and colored with crayons in giant coloring books. Then tragedy struck about two years ago. We were looking at the toys in the store, because Little Sister wanted to buy another pony with her own, saved up money. The ponies had been replaced with weird-looking, oddly-shaped imposter MLPs! Where were the real ponies? One day, we happened across the new My Little Pony: Friendship is Magic cartoon series. Big Sister and I watched with Little Sister. Our curiousity won out against the deep desire to change the channel to Animal Planet. I made up my mind that I was not going to like the show and that would be the last time any of us watched it. How could they ruin my ponies like that? Why would they make them with those giant eyes and pointy little noses that looked nothing like horse faces? What did they do to my–bwahahahahahaha! We laughed so hard during that episode. These were not my ponies at all! They were funny, witty, snarky, sleak, and evilly funny. When I say “evil,” I mean that in a good way–absolutely nothing literal about that. (Although, there are some people out there who really think MLP is evil. *shakes head*) These ponies are not push overs. 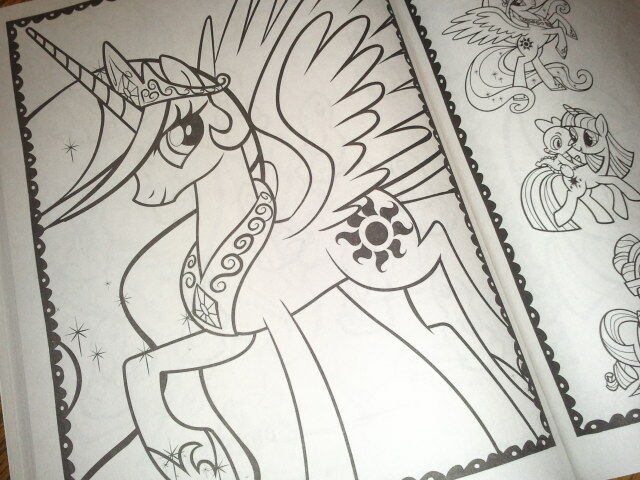 Princess Celestia is the sleekest pony. Another huge difference is there is a huge following of adult men who call themselves Bronies. Yes, the Friendship is Magic series includes B-O-Y-S! If I had to pick a favorite of the six main characters, it would have to be Pinkie Pie. She likes parties and sweets, but she’s clever and sings awesome songs (“Face Your Fears” is very cool). Wait, Twilight Sparkle lives in the library and loves books and is purple. I don’t find it a bit strange that no one in town ever checks out any books. It’s too hard to choose. There is something to love about all of them. Go to the Hub website here or the Hasbro website here to check out video clips. The official MLP YouTube site doesn’t seem to be working as I write this. There is a lot of creepy fanfic stuff on YouTube related to MLP (some is quite disturbing, so don’t let your kids surf YouTube for MLP–stick with the Hub or Hasbro sites). What was your favorite cartoon as a youngster (young at heart counts)? Do you have a favorite show or character who has been rebooted a few times? (I’m totally thinking about Spider-Man now.) Was the reboot worth it or a waste?